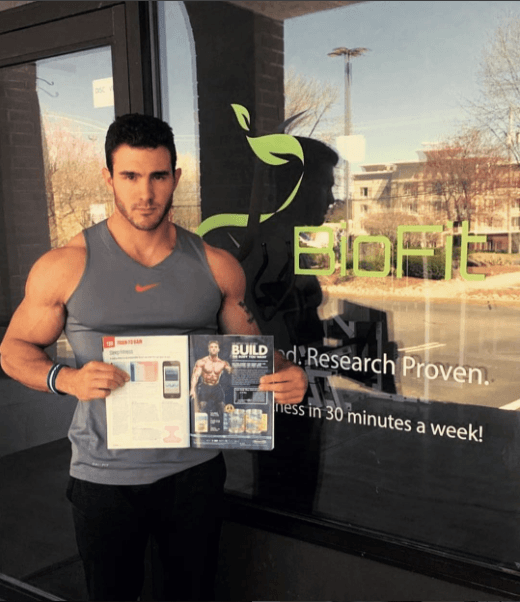 Jay Vincent in front of his studio, BioFit, and showing a his featured MuscleTech ad. Jay Vincent is a nationally recognized personal trainer, health coach and professional fitness model. As the owner and primary trainer at BioFit, Jay’s mission is to instruct highly effective, time efficient, and safe exercises for people of all ages, goals and physical conditions. Jay has been featured on many popular Podcast interviews, magazines and has modeled for popular athletic companies such as Under Armour and MuscleTech. This is Jay’s second appearance on the podcast. In our first interview, we discussed Jay’s HIT and diet regimen. Click here to listen. Furthermore, Jay currently trains just once every 7-10 days for 20 minutes. Check out his current routine here. Please help me to learn more about your needs by filling in my survey – click here. QUESTION(S) OF THE DAY: What was your key takeaway? Please let me know in the comments.